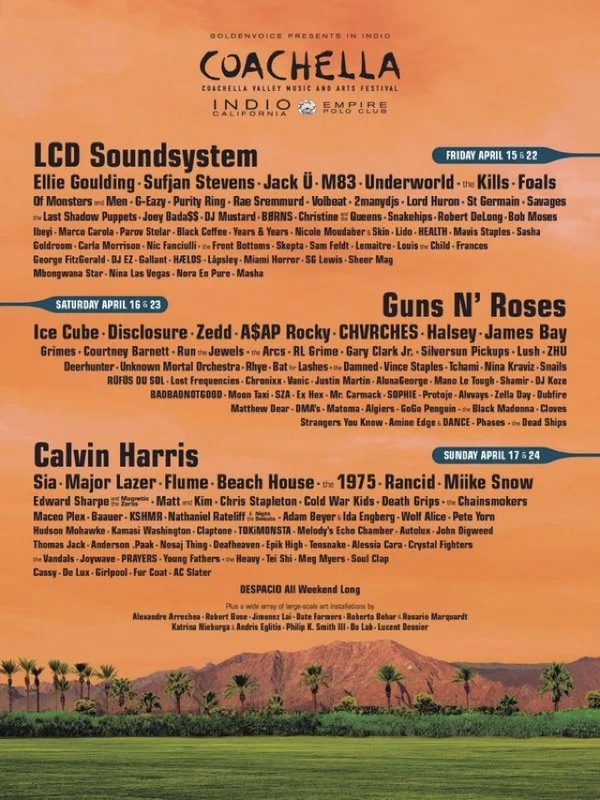 After many rumors, including ones from "idiots," Guns N&apos; Roses and LCD Soundsystem are both reuniting for Coachella as headliners. Taylor Swift&apos;s boyfriend is the third headliner, but more exciting is Ice Cube on Day 2. Other notable performers are Sia, Ellie Goulding, Run the Jewels, Underworld, Sufjan Stevens, CHVRCHES, A$AP Rocky, Disclosure, Rae Sremmurd, Joey Bada$$ and Jack Ü (Diplo&apos;s and Skrillex&apos;s side group). Consequence of Sound has some details on why LCD Soundsystem is getting back together, in spite of frontman James Murphy&apos;s many projects, "Sources tell Consequence of Sound that the impetus for LCD Soundsystem’s decision to reunite so soon after their highly publicized farewell came thanks to a lucrative, multi-million dollar offer from AEG Live. Aside from the financial return, AEG’s offer provided LCD Soundsystem the chance to headline one of America’s most prestigious music festivals in Coachella, along with AEG’s other Los Angeles festival, the fast-rising FYF Fest, which takes place next August." In other words, the beer money may have run out! Coachella will be April 15-17 and April 22-24 in Indio, where dehydration&apos;s upside is thinspo and you may see some loincloths.